As they say, "Keep it Wheel." And, the Funko Pop Disney Cars figures definitely keep the lovable vehicles real. The Funko Pop Disney Cars lineup features the talking red stock car, Lightning McQueen, along with Mater, Doc Hudson and Ramone. Exclusives come with the 2015 San Diego Comic-Con Lightning McQueen Dinoco, 2015 New York Comic Con Mater in Mint Condition, and green Ramone issued through Target. Shop for Pop Cars Figures on Amazon. 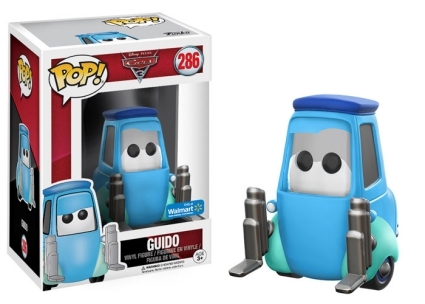 Funko Pop Disney Cars' second installment offers a few debut figures for Cars 3, including Cruz Ramirez. In addition, Lightning McQueen receives an updated appearance via the Target-exclusive chrome, and a dull grey version found at Meijer locations. Fans and collectors of the Cars franchise can also look for Luigi and Guido at Walmart outlets. Numbered as part of the main Pop! Disney line, the Cars set does not match the standard Pop! sizing since each figure mirrors the animated vehicle form. Click on the links or images to shop for figures on Amazon or eBay. Disney Pixar Cars Dinoco Lightning McQueen SDCC 2015 Funko Pop!